Leaf Links in GTA Vice City. 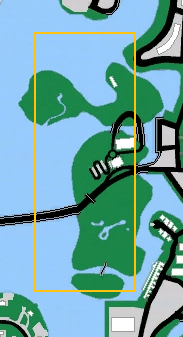 Leaf Links is an golf course in Grand Theft Auto: Vice City and Grand Theft Auto: Vice City Stories based on a chain of islands in Vice City. Located just west of Vice Beach, it is surrounded by water and condominiums, and is a major attraction for the wealthy. Golfers are constantly seen in the area, defending it with gang-like vigor when attacked. The Comet also spawns at the main building, where the two guards patrol the entrance. Firearms and other weapons (with the exception of brass knuckles) are not permitted on the course, and a metal-detector is located at the entrance, which automatically strips all weapons from the player and leaves them to be collected outside. Unfortunately, if the player has more than 6 weapons with him/her, only 6 of those weapons will be there. However, this can be bypassed by climbing onto a high enough vehicle and jumping over the hedge. The name "Leaf Links" may be based on Leith Links, a park in Edinburgh, where Vice City's creators, Rockstar North are located, and where the game of golf originated. However, it's based off the Normandy Shores Golf Course in Miami. This page was last modified on 1 October 2011, at 09:42.